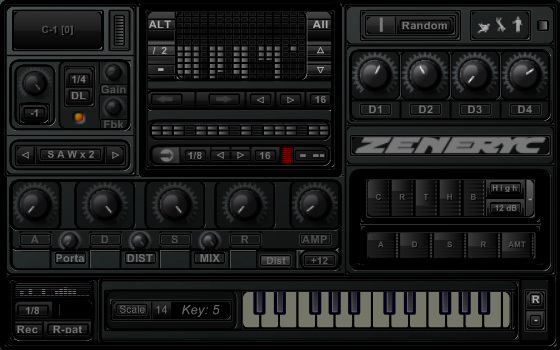 ZeNeRyC is a virtual synth dedicated to psytrance. 2x OSC: Saw, 2xSaw, Square, Ramp, 9 voices detuned saw. 1x tuner per OSC with random. 1x detune knob for detuned OSC. 1x amp decay per OSC. 1x detune knob for all OSC waveforms. 1x gain knob per OSC. 1x multi-state filter per OSC: Low, High, Band Pass, Band Reject, Peak, cutoff, resonance, pitch tracking. 1x free running LFO for pitch modulation per OSC with speed and depth. Sequencer has adjustable speed (normal/half), adjustable number of steps (up to 16), shift note, transpose, random notes and init pattern. Can be turned on/off with any CC and patterns can also be selected with any CC (thru MIDI learn). Groover: with adjustable timing, 16 steps, shift left/right, random, 8 lock ‘n’ recall memory slots. Can be turned on/off with any CC and patterns can also be selected with any CC (thru MIDI learn). Global functions for sequencer and groover: global shift left/right, random all and alter pattern. 1x master multi-pole filter(12&24dB) with variable state, invert env, cutoff, resonance, pitch tracking, Low freq cut, and a signal boost. 1x StepLFO filter modulation controlled by the master filter envelope: with adjustable timing, 16 steps, shift left/right, random, 8 lock ‘n’ recall memory slots. Can be turned on/off with any CC and patterns can also be selected with any CC (thru MIDI learn). Fx section with phaser, distortion, stereo widener/boost, flanger, chorus, reverb and BPM delay.